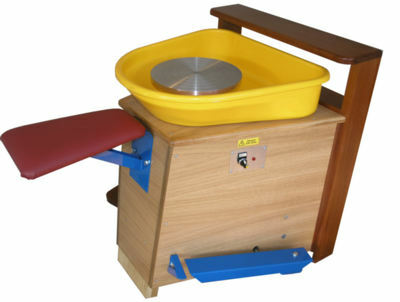 A high quality range of Pottery workshop machinery, chosen for it's relaibility and build quality. G64 Wall Mounted Clay Extruder. Cast aluminium frame and ratchet system for lightness. Aluminium 3 inch barrel. 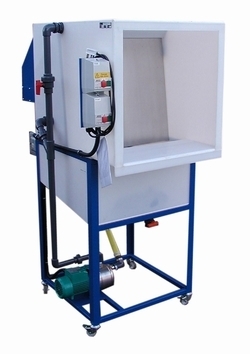 G64SER As above Wall mounted Clay Extruder, but with die set included. PLEASE NOTE only standard dies are included NOT Hollow Dies ( top three shapes ). G66 Set of dies for extruding Hollow sections. 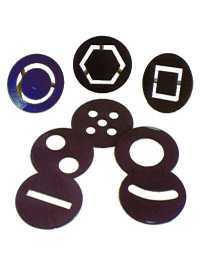 Set OF THREE consists of Hexagon , Round and Square. Please phone 01782 598729 for more details. G76 76mm (3 inch) outlet Pugmill for extruding clay.Fitted with Integral Vacuum System for removal of air from clay before extrusion. G165 With the environment in mind this is the next step in anti pollution and reclamation of product. A water sheet runs down the back of the Booth to catch the majority of the glaze/colour whilst a fan withdraws any dust. Any extra matter is captured in a bag and can thus be reclaimed at a later date. G166 With the environment in mind this is the next step in anti pollution and reclamation of product. A water sheet runs down the back of the Booth to catch the majority of the glaze/colour whilst a fan withdraws any dust. Any extra matter is captured in a bag and can thus be reclaimed at a later date. 16 amp supply is recommended, although a 13 amp supply will suffice if the starting sequence is strictly adhered to. 5508 This fully automatic Air Compressor includes a powerful 2.5HP induction motor, which operates from a 13amp supply. Producing 9.5cfm of air displacement and working up to 116psi, this brings a totally different dimension to the way you might tackle projects without the use of manual or electronic power tools. Fitted with a twin air outlets, the adjustable outlet pressure from the large 24 litre capacity air receiver makes this machine a winner in its class. 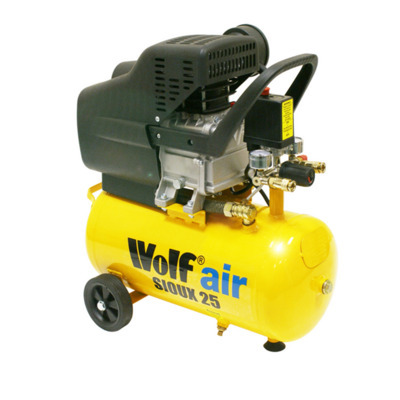 The Wolf Sioux II Air Compressor is hand built by our expertly trained engineers, which assures that it has been manufactured and built to the highest standards of quality. 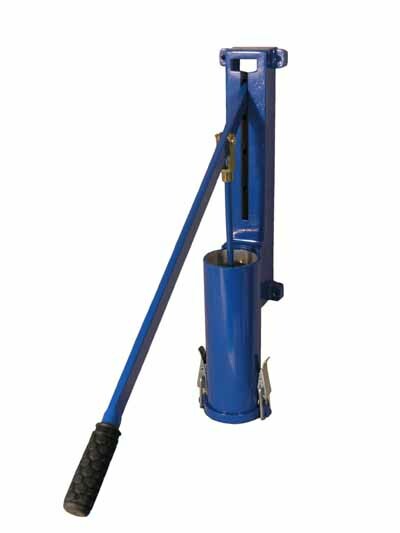 In addition to Spray Guns, the compressor will operate scores of air tools such as air drills, nailers, staplers, chisels, die grinders, impact wrenches, ratchets, the list goes on. 450 Efficient 450 cubic feet per minute extraction rate,this unit is ideal for the hobby or where space is limited. 13 amp supply, so simply plug in and use. 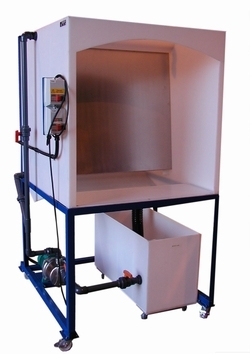 This self contained unit can be supplied with the stand if requested. The top of the spray booth is of a semi-transparent polypropylene allowing light to the work area. All other sides are of a white reflective material again to eliminate dark areas. Supplied with removable a filter. For Water Based Products ONLY! 5000 The ideal wheel for the first time potter or for the potter who wishes to throw pots the traditional way. Both wheels are constructed with a steel framework which support the operating mechanism.In the case of the Seated Kick Wheel, the Wheelhead is very heavy cast iron and acts as the momentum whilst throwing. The Standing Kick Wheel has a fully enclosed flywheel just below the wheel head. Both wheels have large splash trays with drainage. 5001 The ideal wheel for the first time potter or for the potter who wishes to throw pots the traditional way. Both wheels are constructed with a steel framework which support the operating mechanism.In the case of the Seated Kick Wheel, the Wheelhead is very heavy cast iron and acts as the momentum whilst throwing. The Standing Kick Wheel has a fully enclosed flywheel just below the wheel head. Both wheels have large splash trays with drainage. Foot pedal reach is adjustable to facilitate use by small children if required. G30 A very strong and stable polished wooden cabinet adds character to this wheel.The drive is widely acclaimed to be one of the finest on the market.The larger version of the famous Alsager. G37 This wheel is a very popular selling wheel and the beauty is that it is easy to transport in a modern hatchback. Wheel Head: 12 inch (305 mm) Aluminium , Optional easy lift and studded wheel heads for bats available,optional upholstered seat. G40 Well designed Sheet steel cabinet with Powder coated funish.Sealed for life bearings and variable speed Electronic control, which gives excellent torque and speed response. SNW A sympathetically designed wheel for Special needs . Designed for Wheelchair users and incorporating features as requested by users themselves. G35 This wheel is probably one of the most popular wheels used by professionals and colleges. 5015 Genuine replacement drive ring for 5006 through to 5014A potters wheels. 5100 An ingenious way of increasing production. 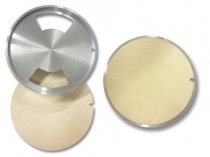 Simply replace your existing wheel head with this wheelhead- ( we need to know your wheel type or thread! )Throw your pot directly onto the batt, and then lift batt and piece off. Replace with a new batt and throw a new piece, and so on. Wheel head comes with one batt. Others are available.- This system fits nearly all standard wheels, further costs could be incurred with very old wheels, where machining has to be done.